Academy of Model Aeronautics (AMA) president Rich Hanson published an editorial column in the April 2017 issue of Model Aviation titled, "How high can I fly?) Ok, more correctly it should have asked, "How high may I fly?" since it addresses the oft-asked question about what altitude limit is imposed on model aircraft. Mr. Hanson does a great job explaining the situation, and points out that the current 400-foot limit has been on the books with the FAA since at least 1972. 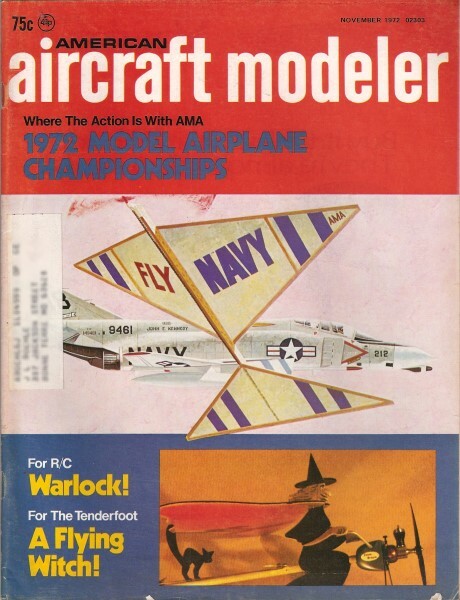 He refers to a full-page notice to model airmen on page 49 of the November 1972 issue of American Aircraft Molder, the AMA monthly publication that preceded Model Aviation. Since the page was not included in the editorial, I have scanned and posted it below. Indeed, the FAA set a 400-foot altitude rule as early as 1972. Then, as now according to Mr. Hanson, 400 feet is a basic guideline that may be superseded under appropriate circumstances. Thank you, President Hanson, for brining that to our attention! 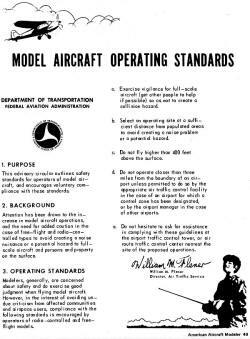 This advisory circular outlines safety standards for operators of model aircraft, and encourages voluntary compliance with these standards. Attention has been drawn to the in­crease in model aircraft operations, and the need for added caution in the case of free-flight and radio-controlled types to avoid creating a noise nuisance or a potential hazard to full-scale aircraft and persons and property on the surface. Modelers, generally, are concerned about, safety and do exercise good judgment when flying model aircraft. However, in the interest of avoiding un­due criticism from affected communities and airspace users, compliance with the following standards is encouraged by operators of radio-controlled and free-flight models. Exercise vigilance for full-scale aircraft (get other people to help if possible) so as not to create a collision hazard. Select an operating site at a suffi­cient distance from populated areas to avoid creating a noise problem or a potential hazard. Do not fly higher than 400 feet above the surface. Do not operate closer than three miles from the boundary of an airport unless permitted to do so by the appropriate air traffic control facility in the case of an airport for which a control zone has been designated, or by the airport man ager in the case of other airports. Do not hesitate to ask for assistance in complying with these guidelines at the airport traffic control tower, or air route traffic control center nearest the site of the proposed operations.